Swiss through and through and yet universally appealing – nostalgic and always up to date. The old stories by Jeremias Gotthelf were filled with larger than life emotions and scenes that need the backdrop of a musical. 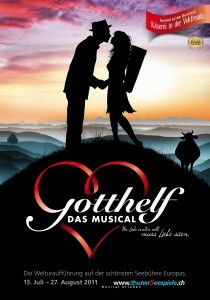 With GOTTHELF – the musical, the successful writers, Charles Lewinsky and Markus Schönholzer, reawaken our national poet in a new light and take him from the idyllic Emmental Valley directly to Broadway in New York City.